As they were numerous, picking out references and connections to The Phillips Collection side-tracked me from my initial intention of finding out more about Ralph Flint himself. I wasn’t able to uncover when he died–but I’m guessing that as Phillips experts can’t either, it’s an elusive date. And though I find Metropolis to be a compelling drawing, I’m not heartbroken that I was unable to find any critical material discussing Flint as an artist. I was truly surprised and satisfied that the clues sprinkled throughout Ralph Flint’s article in Art and Understanding and his letter to Duncan Phillips began to build an idea of who Flint was, in relation to the art world of his time and to the legacy of The Phillips Collection. 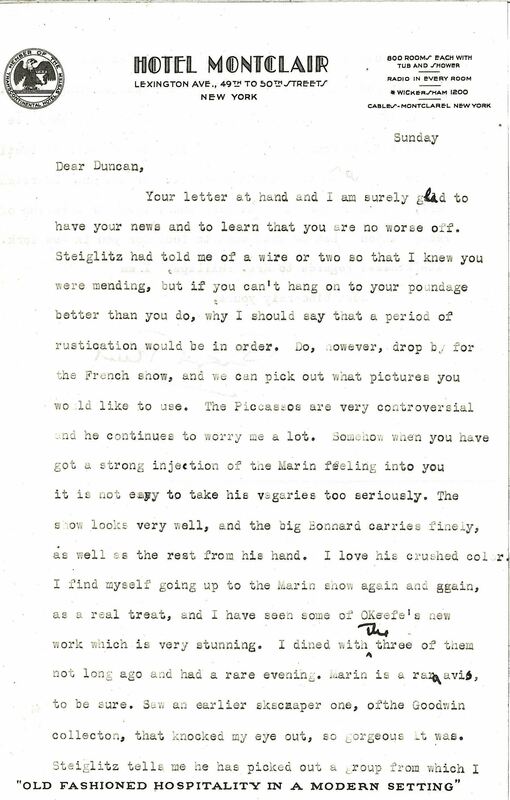 His writing is lively and opinionated, and it is interesting to see how that spirited prose translates to a personal missive of the kind he sent to Phillips. 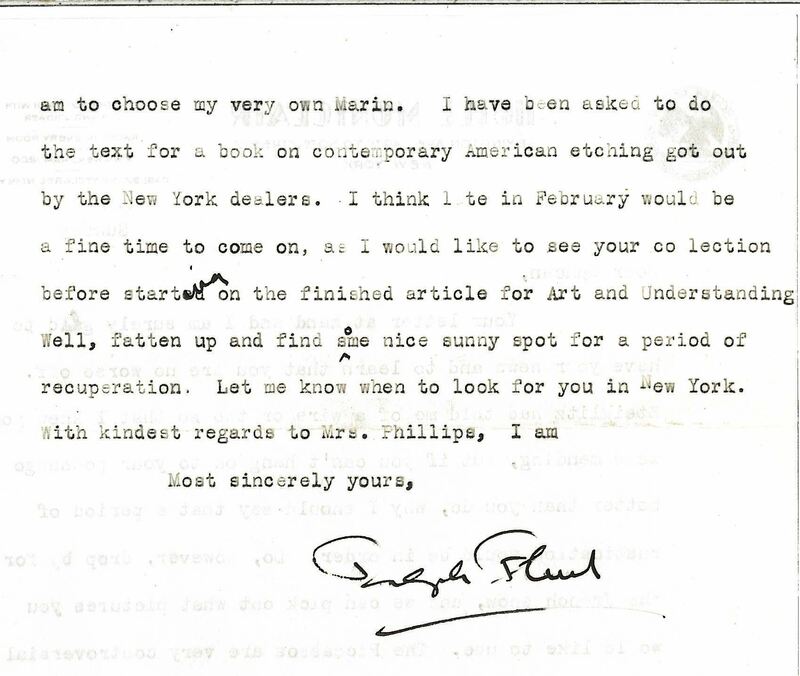 Learning from the letter that Flint was friends with Stieglitz, O’Keeffe, and Marin makes it fun to read his favorable reviews of their work in Phillips’s magazine, like I’m in on a joke. The time frame of these documents too, I think, makes them especially exciting to examine in context. Duncan Phillips, somewhat infamously, reacted with strong opposition to the modernism to which he was exposed at the Armory Show in 1913. In his1914 publication Enchantment of Art, Phillips lambastes many of the artists he went on to collect in later years. He calls Cézanne and van Gogh “unbalanced fanatics” for their subjective interpretations of nature, Gauguin a “half savage,” and describes Matisse’s work as “detestable.” In an essay in The Eye of Duncan Phillips: A Collection in the Making, David W. Scott points out that for Phillips’s 1927 edition of Enchantment of Art under the revised title Enchantment of Art: As Part of the Enchantment of Experience Fifteen Years Later, Phillips significantly revised the book to reflect his evolving taste. 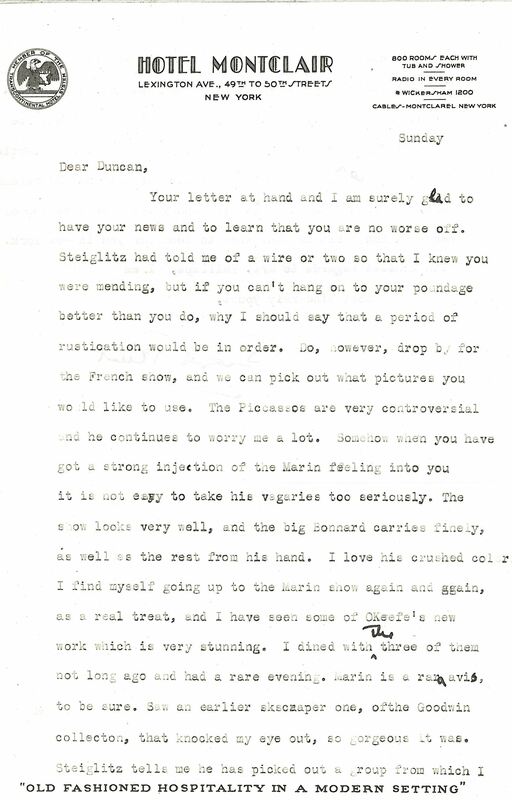 In 1927, Phillips writes that “to the charge of inconsistency I plead guilty, but it does not trouble my conscience. Consistency from youth to middle age is at best a stiff-necked virtue.” It was around 1926 that Phillips met and began a friendship with Stieglitz, the influence of whom, Scott suggests, allowed Phillips to embrace contemporary art and reconsider artists he had previously dismissed. In this context, to have uncovered the relationship between Flint and Phillips through my initial attraction to Flint’s wholly modern drawing seems wonderfully fitting. This entry was posted in Experiment Station and tagged Duncan Phillips, John Marin, library, Ralph Flint. Bookmark the permalink. Thanks for this further information. Now if you can find anything out about Ralph Flint’s death date and place, please let me know. Our Metropolis work by Ralph Flint has not been exhibited in recent memory, and we have no label information on his death. I was so interested in discovering this this afternoon. We have three original Ralph Flint works…one of which he considered his masterpiece. He was a student of Swami Paramananda in Boston at the original Vedanta Centre. Mr. Flint designed a large thousand-petal OM and two altars circa 1914. He decorated the chapel, as well, for the headquarters at #1 Queensbury Street.